After sitting it out for 3 weeks straight we finally managed to get wind for our Wednesday night race. The wolf-pack has been feasting on 4-5 downwinds per week – and tonight we got very contestable conditions with a 15-23knot breeze and a solid 2-3m swell pounding the put in and exit areas. 30 paddlers lined up with a good handful of newcomers. Dani Reinhart from Switzerland who took 2nd to Ethan Koopmans at the NISCO Worlds in Las Vegas last year, swapped out his windsurfer and flatwater SUP board for a downwind Glide. 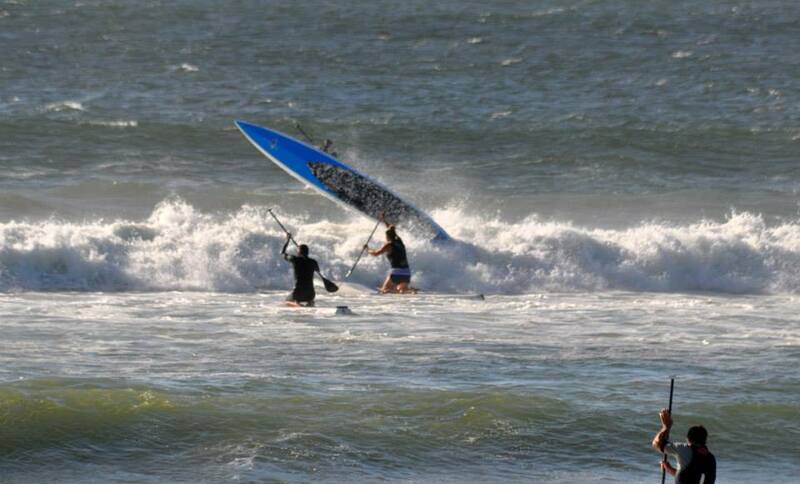 Sebastien Cattelan made a welcome return on his inflatable but promptly broke his paddle and canoed his way to the finish where he chose to not go through the finish gate to register a DNF….never a dull moment! First start had Mishka Steyn and Armien Wohlgemuth power through the surf and clear the backline with virtually no mishaps. 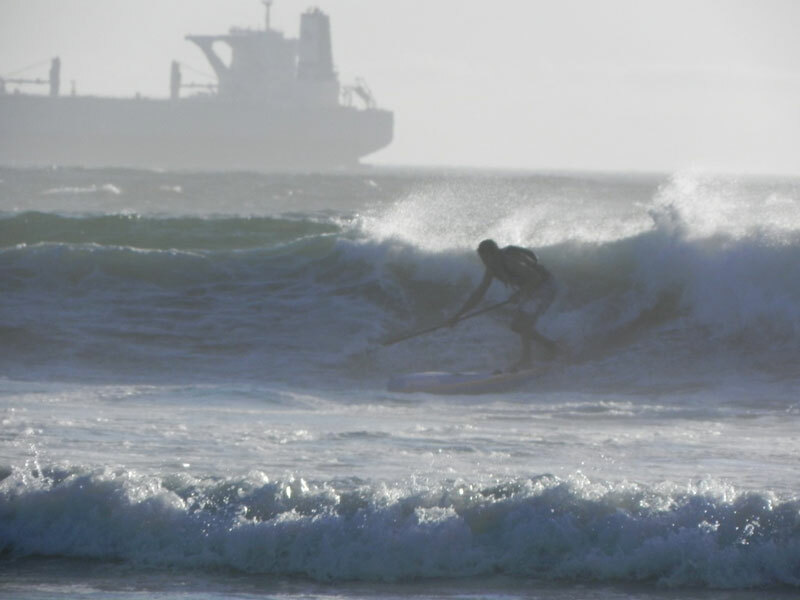 Tarryn Kite who will be representing SA in Nicaragua in the wave discipline took a belter on the head and went flying along with a good couple of other paddlers. Everyone somehow got through and off they went with Armien setting the pace in convincing fashion. Second start and Dylan powered away to yet again take a massive lead with Ethan seemingly needing a couple of km’s before he picks up his pace. As Dylan enters Small bay and the final stretch, Ethan has closed the gap and they ended up in another beach sprint. Dylan’s handle on the front rail seemed to give him an advantage as he sprinted effortlessly to the finish while Ethan was doing 360’s with his board. Ethan had managed to finish the race despite a broken paddle which made his handle un-useable, forcing him to choke-stroke the entire way…seems like the choke stroke works just fine! These two youngsters are now making the pursuit team look a bit jaded with next paddler in nearly 4 minutes behind….looking forward to the return of higher winds, the Bertish bros and Ivan van Vuuren to level the field a bit! In the ladies Mishka Steyn continued her fine form of yester-year and smashed the other ladies by 3 minutes with Brigette van Aswegen in 2nd and first-timer Emma Reymerink from Holland in 3rd. 4th was Monika Wolgemuth, who was also our only Masters Lady tonight. Mens Masters was won by Peter Petersen with Armien Wohlgemuth in 2nd ahead of Gary van Rooyen. Talking of Masters, Robby Naish has been in town this week for the Red Bull King of the Air – he unfortunately couldn’t be at the PRIMI Naish event as he had other commitments with Red Bull lined up – but he sends his personal greetings to the entire fleet saying how impressed he is with the downwind series and passion for SUP in Cape Town. He had some cracker waves in the morning with Ethan and Kevin Langeree and has been spreading the stoke where-ever he goes. True legend! Next week is looking promising with wind predicted with another 18second swell!!! !